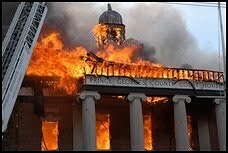 The historic 1939 Circuit Court building was devastated by fire in 2004, completely destroying the ornate Duvall Wing. 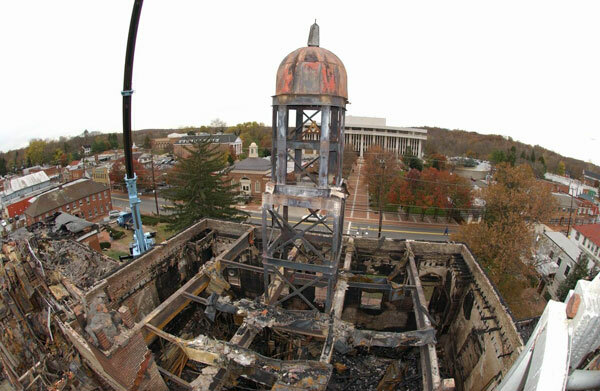 The old bell tower that was atop the portico entry had been reduced to the structural frame and the historic bell within had crashed down to the ground during the fire. 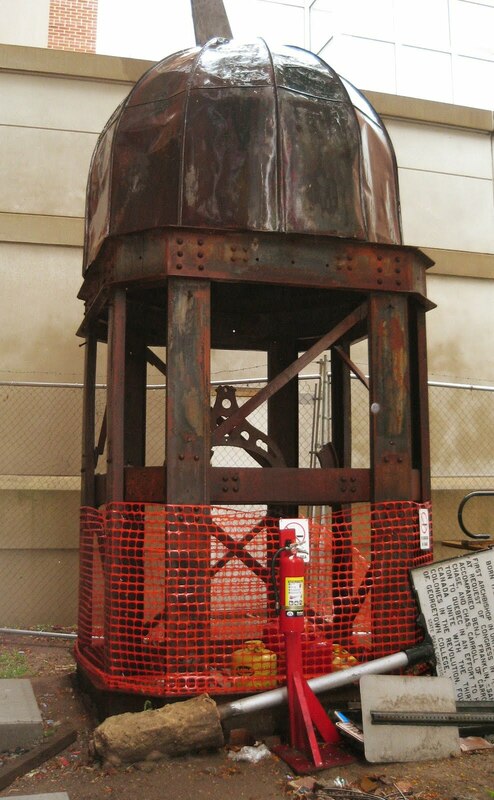 For a number of years, during the renovation of the courthouse, the bell tower structure continued to deteriorate on what had become a construction site for both the courthouse expansion and the renovation of the damaged courthouse. The structural remains of the original 1939 bell tower cupola. 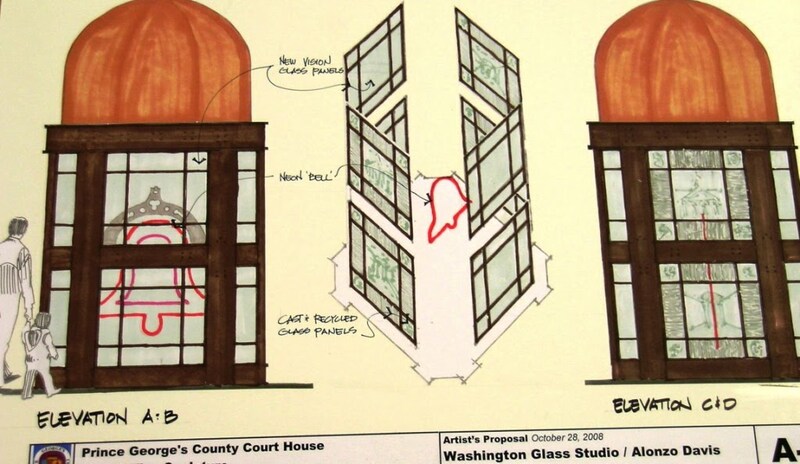 In 2008, Prince George’s County asked two of the artists that had made artwork for the interior of the Marbury Wing court expansion to collaborate and come up with some concepts for the front entry courtyard of the refurbished court building as it neared completion. Early on, the decision was made to restore the original bell tower cupola as the center point of the public artwork sculpture, and that informed the many design concepts explored. 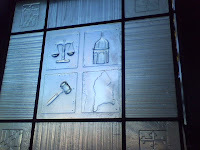 Infill panels made of cast glass with courthouse/legal imagery, sandcarved glass infill panels, backlighting with computer controlled LED panel lighting effects, neon lighting – were some of the many different ideas that were explored and the design options were narrowed down, documented and presented to the courthouse committee, headed by Circuit Court Judge Sheila Tillerson-Adams. 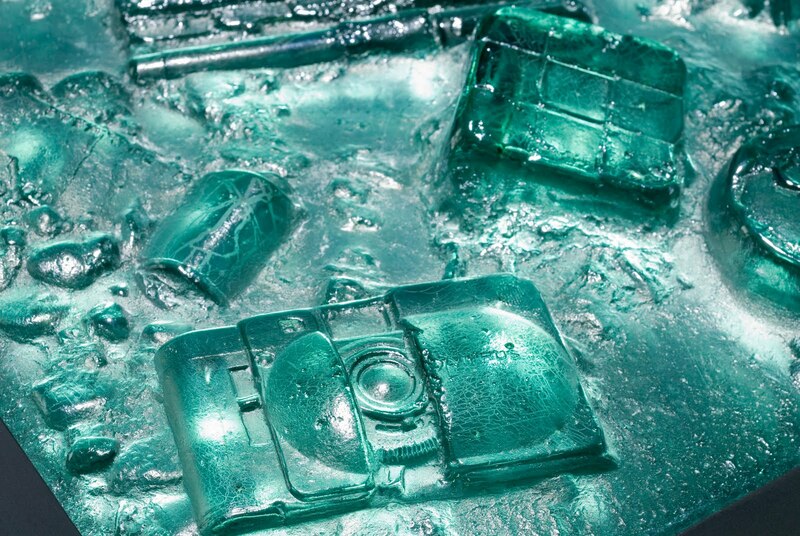 Different concepts of integration of lighting and cast recycled glass were explored. 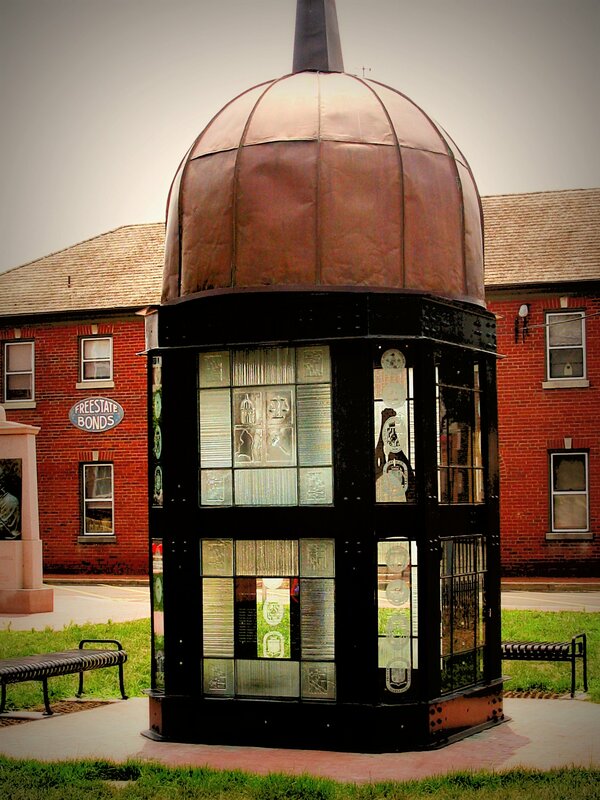 Titled “Rebirth and Renewal “, the concept was modified with input from the judges and the committee, and in late 2009, the original steel structure and copper dome top was restored and set into a new paved area outside the courthouse, near the main courthouse entry. 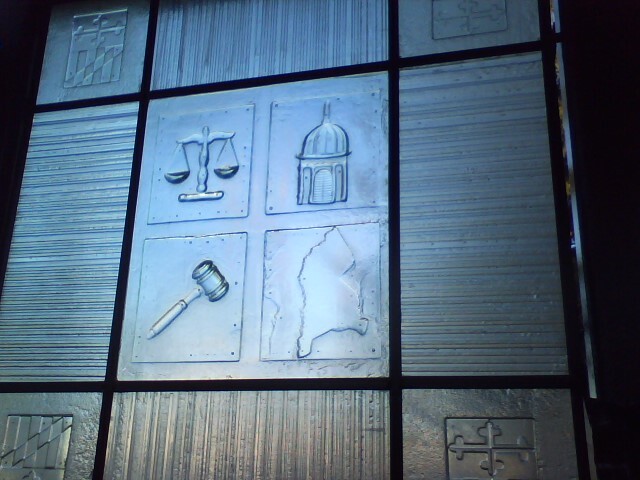 Glass began being cast into bas-relief panels with imagery based on the courts, the legal system, Prince George’s County, and the original court building. Cast bas-relief panels made from recycled glass were made with court and community based imagery. Michael Janis begins coldworking the panels. 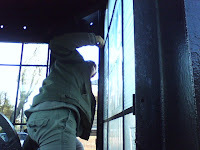 Nicole Puzan installs the cast textured panels into the steel framework. 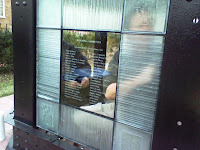 Steel frames were made for the glass panel infill support. 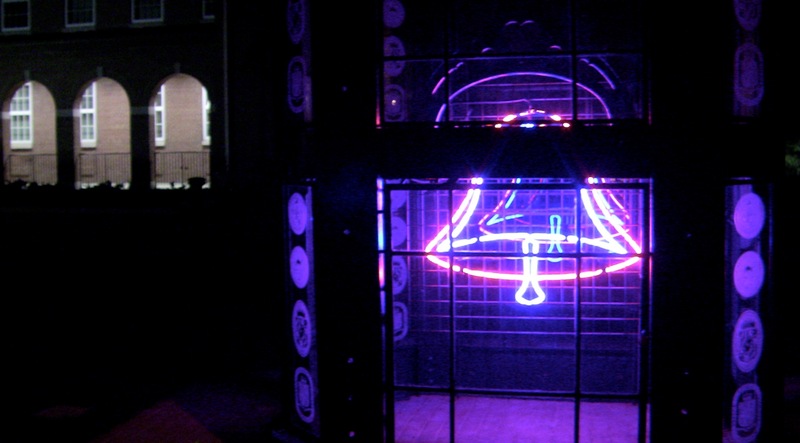 Neon artist Marty King made a neon representation of the original bell of the bell tower, which, by tradition, was struck at 9.30 am each day court was in session. An engineer certified the original bell tower cupola’s structural integrity for the modifications and reuse. Custom benches for seating around the artwork were started. 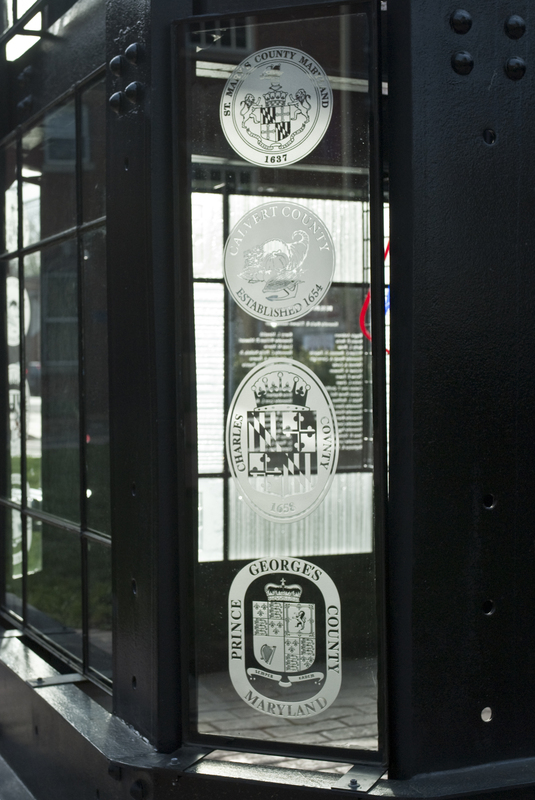 The chamfered corner panel infills were designed to incorporate detailed county seals representing the counties served by the Circuit Court. These panels were clear, with deep, intricate sandcarved panels. 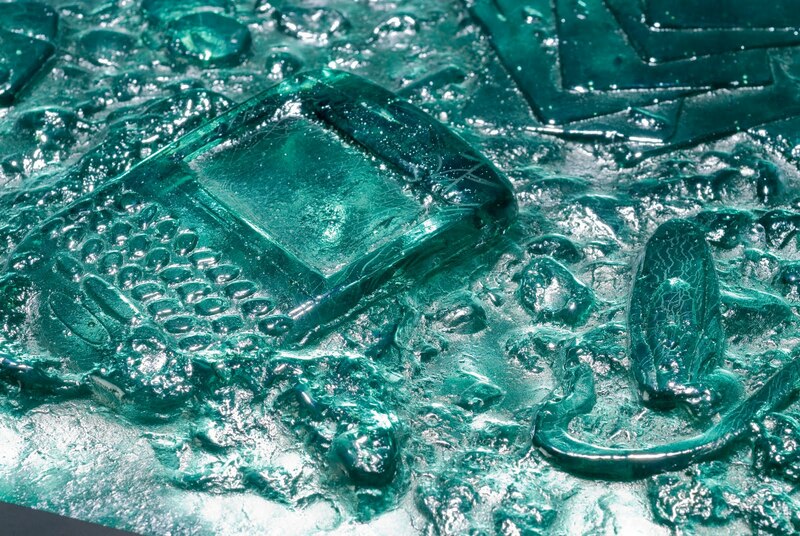 In December of 2009, all the elements were coming together, and installation of the cast glass began. Erwin Timmers tests the neon. Erwin Timmers and Alonzo Davis bolt the infill panels to the steel structure. 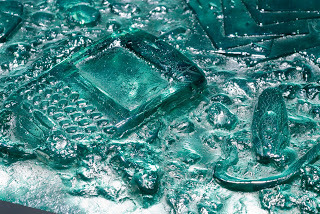 During the installation, the Washington, DC area was hit by two snowstorms that dumped the largest amount of snow ever recorded in the area’s history, and installation had to work around the snow removal efforts. The Circuit Court for Prince George’s County shares the Seventh Judicial Circuit with the Circuit Courts for Calvert, Charles and St. Mary’s counties. Seals of each of the counties are presented in the artwork. 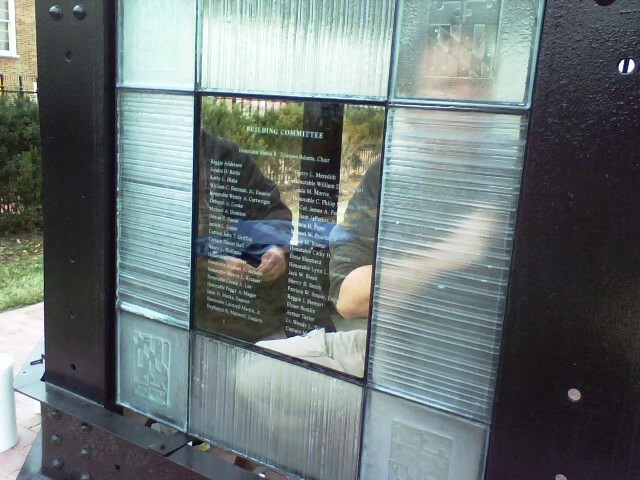 The names of the Circuit Court refurbishment committee are acknowledged in sandcarved panels mounted in the glass and steel sculpture. The cast recycled glass alternates with clear glass to allow alternating views looking into the neon bell sculpture and allowing diffused lighting from the neon to illuminate the cast glass symbols.The final elements were recently installed, and the neon switched on. The artwork “Rebirth and Renewal” at night. Works inspired by the spirit of adventure, exploration or utopian visions are sought. Fantastic Journeys will be jurored by Beatrice Gralton, the Evelyn S. Nef Assistant Curator of Contemporary Art at the Corcoran Gallery of Art. The exhibition will run from June 17 through July 31. 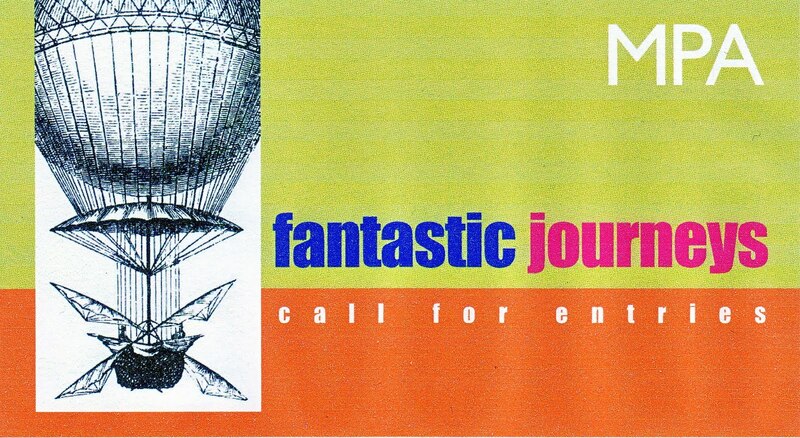 Deadline for submission is April 12, 2010 at 5pm. 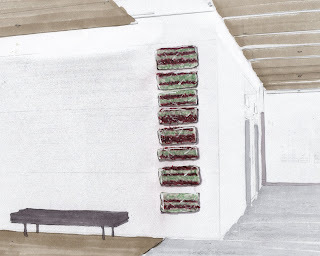 All Mid-Atlantic artists (DC,VA, MD, PA, NJ, DE,WV) are invited to submit up to four digital images (jpegs) of 2 or3-dimensional, installation or video works completed within the last two years and not previously exhibited at MPA. Works that move beyond traditional forms and media are encouraged. Works must fit through a 81″ x 65″ doorway. AWARDS Cash prizes totaling $1,500 will be awarded by the juror. Decisions are final. Click HERE to get the MPA submission pdf. Robert Kincheloe (our new studio coordinator/resident artist/flamework artist extraordinaire) was just awarded Glasscraft’s Emerging Artist Award for his “outstanding skill” and for his “technical and artistic innovation”. 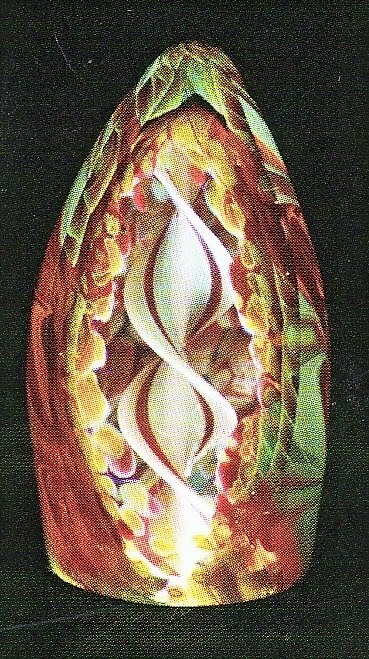 The glass journal The Flow , features a profile article about Robert and his amazing flamework art. Previous winners of the emerging artist award includes Steve Sizelove, Christian Luginger and one of our favorite flameworking artists; Carmen Lozar. Click HERE to jump to Roberts website. Registration For Classes – ONLINE! Have a look at the class list below – registration is now easy-peasy-lemon-squeezy. Amy Morton of Morton Fine Art will have the grand opening for a pop-up project, a series of innovative, curated art exhibitions and events that “pop-up” at various locations throughout Washington, DC this Friday, March 26, 2010. 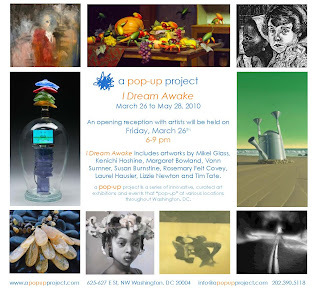 The first exhibition, I Dream Awake runs from March 26 to May 28, 2010 at625-627 E St, NW, Washington, DC (the former Numark Gallery space in Penn Quarter). I Dream Awake is a curated selection of works that presents original artist expressions which explore the link between awakened realities and unconscious dreams. 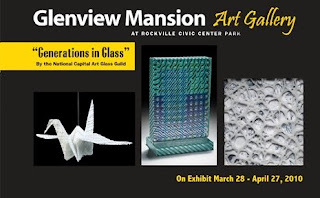 The exhibition includes artwork in various media by New York artists, Mikel Glass, Kenichi Hoshine and Margaret Bowland; Los Angeles artists Vonn Sumner and Susan Burnstine; and local artists Rosemary Feit Covey, Laurel Hausler, Lizzie Newton and our glass guru, Tim Tate. Amy Morton says of her first pop-up show: “The premise for the opening exhibition, came to me in the form of a dream a few months ago. I have long valued how my mind works while I am asleep, particularly in the realm of creativity and problem-solving. Coded answers to core questions regarding the individual or collective human condition can be accessed, digested and discovered in the gray area between the conscious and the unconscious…I Dream Awake is a selection of talented artists from DC, NYC and LA that highlights the power of this area of the human mind and how it affects and moves us”. The formal opening reception with the artists in attendance will be held on Friday, March 26th from 6 – 9pm. Crafts America Shows announces a call to artists for the 23rd Annual Washington Craft Show, a juried show open to all American craft artists to be held November 19, 20, and 21, 2010, at the Washington Convention Center, in Washington, D.C.
Artists must apply online by April 1, 2010 at www.craftsamericashows.com. The cost is $40 to enter up to five images representative of the artists’ work. 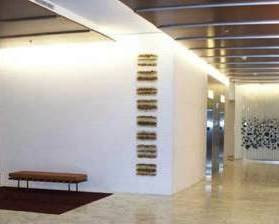 The artists selected by jury will be notified by June 1, 2010. Cash awards are given for Best in Show, Collectors’ Award, and categories. This prestigious show of contemporary craft in America will feature 190 artists jury selected by professionals in the field of fine craft. 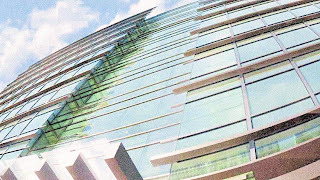 Jurors’ selections are based on the level of technical skill, quality of workmanship, and originality of design. Accepted work represents a broad spectrum of media, technique, and creative design. 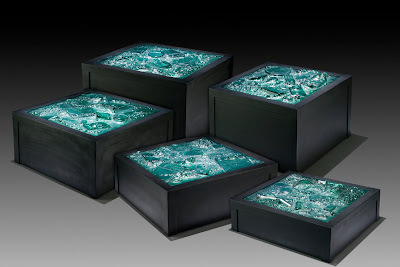 The following categories of contemporary fine craft art are eligible: furniture, glass, jewelry, leather, metal, mixed media, paper, wood, basketry, ceramics, wearable fiber, and decorative fiber. All craft work must be well conceived and expertly executed. Each piece must be made by hand or with the use of appropriate tools. Whether one-of-a-kind or limited production, work should reflect the creativity and individuality of the artist. In addition to the works by artists for sale, the Washington Craft Show will present demonstrations by artists, a fashion show and discussions with prominent speakers regarding the state of the craft industry today. 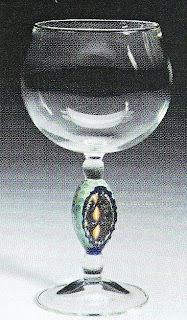 General Information and Applications: www.craftsamericashows.com. Noted art critic, art dealer and tireless promoter of the arts – F Lennox (Lenny) Campello hosts a free seminar on how an artist can move to the next level that is sponsored by the Gateway Arts Center this coming April 10, from 1 – 5 pm. Called Boot Camp for Artists – it addresses topics on maximizing the attention your work gets from the press, galleries, and museum curators. The program is free, but space is limited. For more info on the seminar, contact John Paradiso at the Gateway CDC (John@Gateway-cdc.org – 301-864-3860 x3). 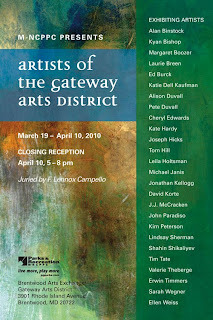 The talk is followed by a closing reception for the exhibition of “Artists of the Gateway Arts District” – the inaugural art show for the beautiful new gallery that is part of the Gateway Arts Center. The reception will be from 5:00 – 8:00pm, Saturday, April 10, 2010.